미호종개는 대전의 갑천, 부여-청양의 지천, 진천의 백곡천 등에서 제한적으로 서식하는 종으로 천연기념물 제454호로 지정되어 보호되고 있으나, 2005년 이후 그 서식 개체수가 감소하여 향후 서식지 지정을 통해 효과적으로 보호할 필요가 있다. 충남 부여군과 청양군을 경계로 흐르는 지천은 실태조사 결과 다수의 미호종개가 서식하는 것으로 확인되었고, 유속이 완만하며, 하상에는 2mm이하의 모래가 주를 이루는 등 미호종개 뿐만아니라 멸종위기보호종 Ⅰ급인 흰수마자 등도 서식하여 어류 서식에 좋은 환경을 갖추고 있다. The Miho spine loach is a species of fish that lives in small numbers in Gapcheon Stream in Daejeon, Jicheon Stream in Buyeo and Cheongyang, and Baekgokcheon Stream in Jincheon. Although it is designated and protected as Natural Monument No. 454, its numbers have decreased since 2005, creating an urgent need for a designated habitat to ensure its protection. 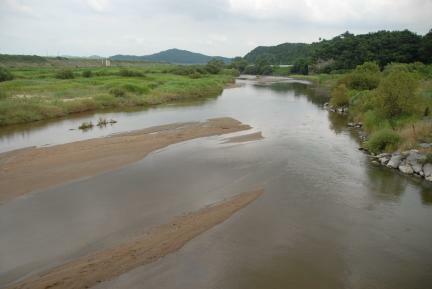 At Jicheon, which flows through the boundary between Buyeo-gun and Cheongyang-gun of Chungcheongnam-do Province, miho spine loaches are found in large numbers. As the water flows slowly, and the layer of sand on the river bed is less than 2mm deep, the habitat is excellent not only for miho spine loach, but also for huinsumaja (Gobiobotia nakdongensis), which belongs to endangered species Class I.